Ok so I'm starting to implement..
Am I correct in saying there is no option to integrate anything else but text box? I have drop down boxes in my JotForm that are not showing up as option, nor are the customised picklists, check boxes etc. that I have in the lead tab of Zoho. You are right, our integration is based on Text Boxes. 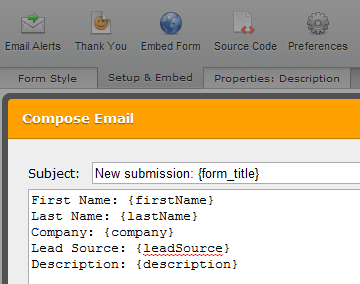 However, you can also use some predefined fields in your integration like Full Name, E-mail, Address and Phone. In order to get split first name and last name you will need to use our Full Name field. I have submit a ticket to our Development Team to add Text Area, Drop Down and Check Box fields to the integration. However, I can not say when or if that request will be processed. We will update this thread once we have any news. What a shame. I just got excited thinking I'd be able to do this without itduzzit.com as an in-between program. Oh well back to the drawing board. Would love to have an eta on the options if you guys decide to include these. Check boxes and drop lists and multi-select fields are very flexible options and I'm sure many Zoho users would be depending on this. Alternatively could you see if it's not possible for jotform fields that are checkboxes or drop lists to be converted to text fields? 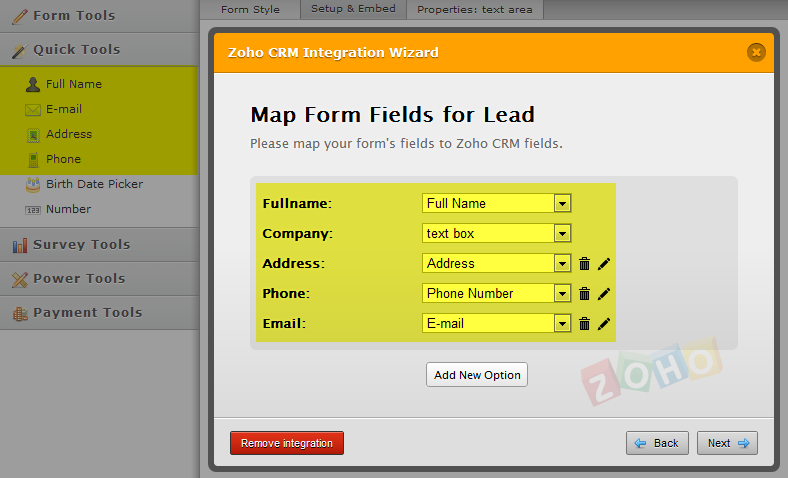 Itduzzit will do this and I've been able to get another form builder form integrated that way with my zoho leads. So we'd at least be able to use any jotform field and the data would transfer into a text field. If check boxes for example were used then the results would appear as comma separated text. Just wanted to ask to confirm (correct me if I'm wrong in assuming this) but I think what is being asked by Birons at the top re: "Also if it is at all possible, can you split first and last name (as opposed to full name?)" is whether you can split the names to receive them as separate data entries when transferring to Zoho? Becasue the jotform field for "full name" is actually 2 fields in one it must be read as something other than a standard text field when trying to map the field with Zoho Leads. Eg. When I select the field in Zoho for "name" then try to map it to what I have used in jotform, the options displayed do not include the first name nor the last name and in fact not any name field. So I guess to answer the above question (unless there is another solution) is to create 2 standard text fields in jotform and use one as first name and the second as the last name. That will allow you to map with the name fields in Zoho. Thanks for bringing this to our attention. One of our developers is working on these issues. Just thought I'd correct what I said about converting to text fields (on July 21, 2012). I'm not actually sure if itduzzit will do this as straight forward as I made it sound but I have had someone set it up for me so that I can have all the check box fields in another form builder delivered to the same text field in zoho. The same is possible for a jotform I'm sure as it is a matter of diverting all the check box results to one single output field then having the accumulated data forwarded on to the correct place in zoho via the API. I'm not really sure if that makes sense as I'm taking a guess at this from what I've discussed with itduzzit tech support and I've had to figure a bit of it out to get a base understanding. I am trying to replicate this with a jot form so I'll see how it goes. Checkbox, dropdown and picklist can now be selected. Only textboxes used to be selected on our form builder. You can now also select dropdown and checkbox fields. Thanks for that. Sorry - I'm not sure if I understand. I can say that I have managed to get the check box field to parse via itduzzit.com (a duzzit connects jotform to my Zoho CRM via an email drop box and pushes it to CRM via the Zoho API). It only sends one check box at a time so I have had to split my check boxes up into single option form fields. That way I can configure the email notification to send that data (it's a long story so I won't go into detail unless you really want to know). I'm still working on it and I think it'll work from what I can tell. Drop down fields will only work if they are not multi-select I think. I hope that all makes some sense. Zoho CRM does not have multi checkboxes. We haven't yet implemented multi dropdown. We will implement it soon. What is the ETA on the integration??? I am also using ZOHO. It is possible to use itduzzit.com as a relay point (I think they have a free account opiton depending on your requirement). I've had help from their tech support to set me up and they have made it so I can send an email from jotform to my itduzzit account with the content required. 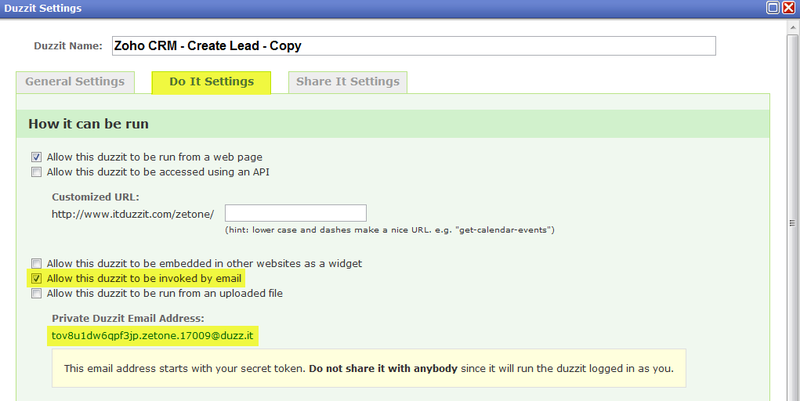 My duzzit then pushes that information to zoho CRM in the format I need as a lead via the Zoho API key. I would not be the best person to explain how but if you set up an account with itduzzit they can help you and I think it would be as simple as copying what they have done for me. I'd just have to make it available for others to use (they have that option in the settings). It will successfully send checkboxes and drop lists and even html text areas content. I've only tested it to confirm it all works so my form is not finished but the tests on the unfinished form did work. I'll confirm when it's done. 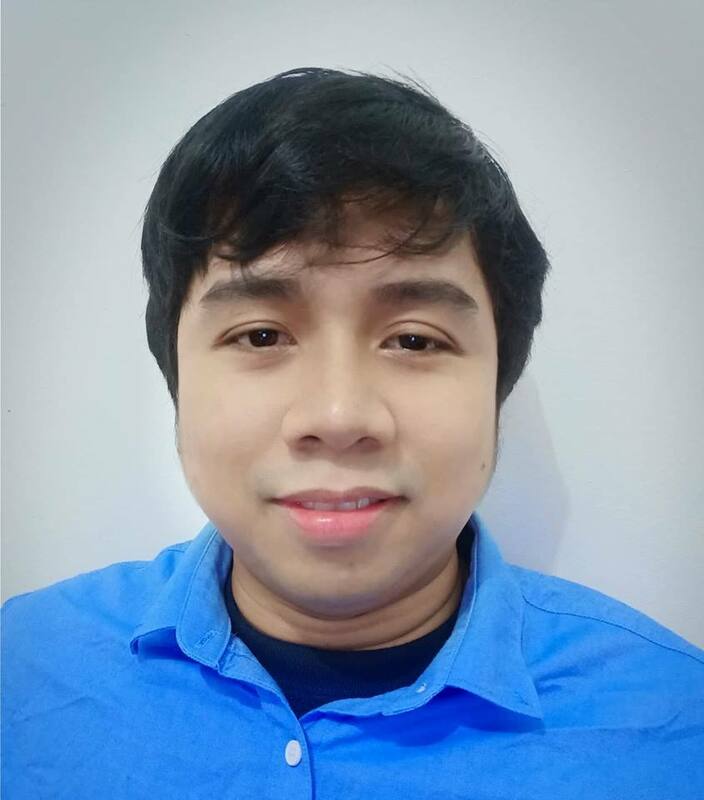 Thank you very much for sharing that integration method. It may be really useful for some JotForm users. 1. Create Duzzit (task) via itDuzzit. 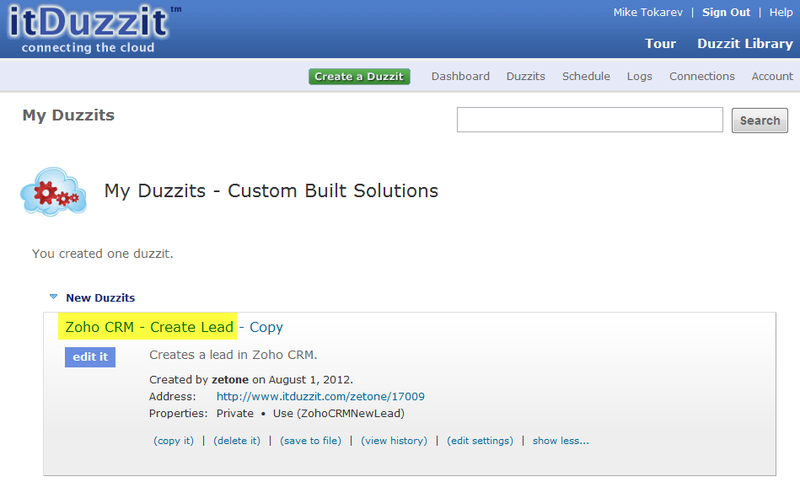 For example, I have created "Zoho CRM - Create Lead" Duzzit. 2. Go to the settings of that Duzzit, and enable "Allow this duzzit to be invoked by email" option. Then, you will get your "Private Duzzit Email Address". 3. Create/Edit your form Notification Email to send the data to "Private Duzzit Email Address" in correct format. You should have the same labes in your Notification Email as you have in ZOHO CRM. It seems to be working fine with Text Boxes, Text Areas and Drop Downs, but I am not quite sure yet how to forward individual Check Boxes to ZOHO CRM. Anyway, I think that itDuzzit Support can help with this. I am happy to inform you that our Developers have already implemented ZOHO CRM integration with Text Areas, Drop Downs and Check Boxes. 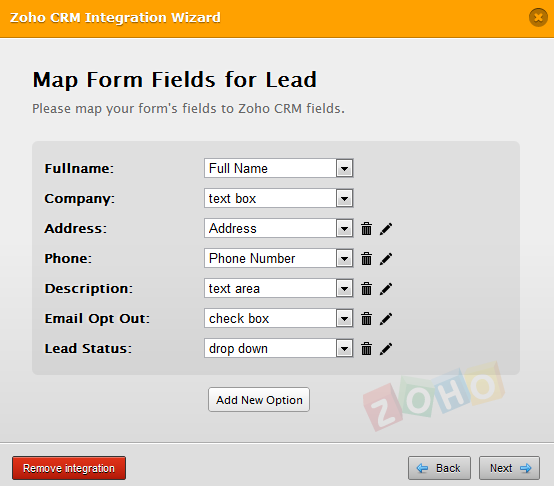 It is possible to map them via Zoho CRM Integration Wizard. Do the new drop down and check box integration features include multi select options or just one and one type of scenario? Zoho CRM doesn't support multi checkboxes so it's not possible. Unfortunately you can only use single choice dropdown for Zoho. I've emailed Zoho many times, if a reply is received it refers me to HELP...................................... nothing helps! This seems to be the philosophy of a dictator to me? Possibly setting you up to pay for something? Anyway reading some comments here at least I'm not the only 1 who has never mastered sorting my emails into NAMED FOLDERS. It also seems answers from Zoho get out of the problems by saying 'it was never intended'? I'm actively looking for a substitute apart from Gmail!